3-year old Ancelet Joby had low platelet count since birth. 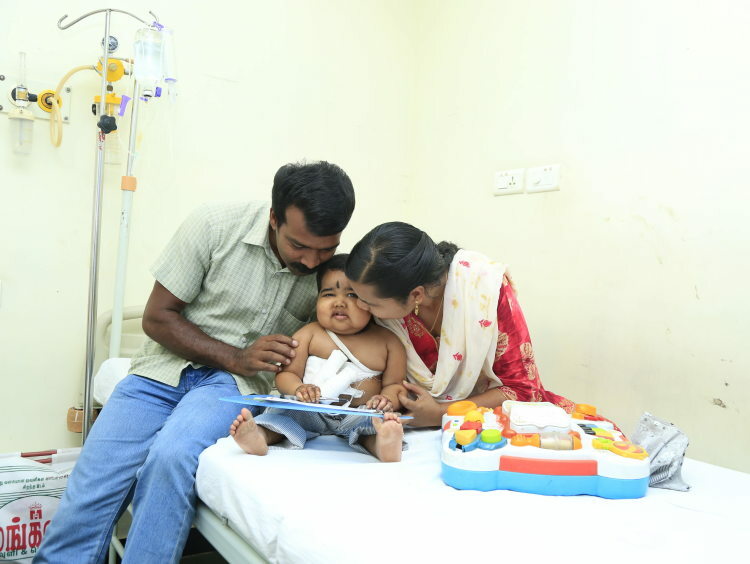 Her parents, Joby and Seeba, knew it meant she would get fevers and infections easily. What they didn’t know until recently was that she could face the same prospect as her older siblings – death – if she does not get a bone-marrow transplant urgently. “We had two children before Ancelet, both of whom passed away at 18 months from spleen rupture. We never knew why our children got sick so regularly – they would get fevers and bleed from their gums. We had taken them to so many doctors; we had even tried alternative forms of medicine like Ayurveda, but nothing worked and we lost them before any diagnosis was done. We prayed for our third child to be alright; but Ancelet was born with a low platelet count too. Even as an infant she would need blood transfusion regularly as her platelet count would dwindle all of a sudden. Her gums would bleed and she would even get painful lesions on her body. We were very scared for her,” says Joby, Ancelet’s father. 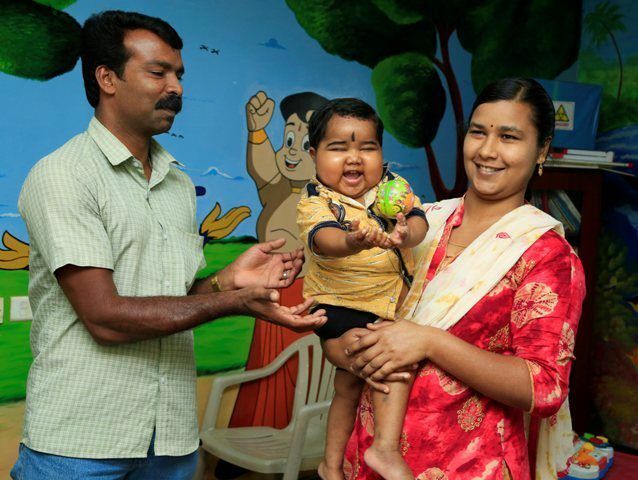 Joby and Seeba wanted their third child to live at any cost. They went from hospital to hospital, even when they did not have enough money in hand, but nobody could get to the bottom of the issue. “Doctors were not able to understand why Ancelet would get these scary symptoms. We even took our blood samples and sent it to many labs across the country. 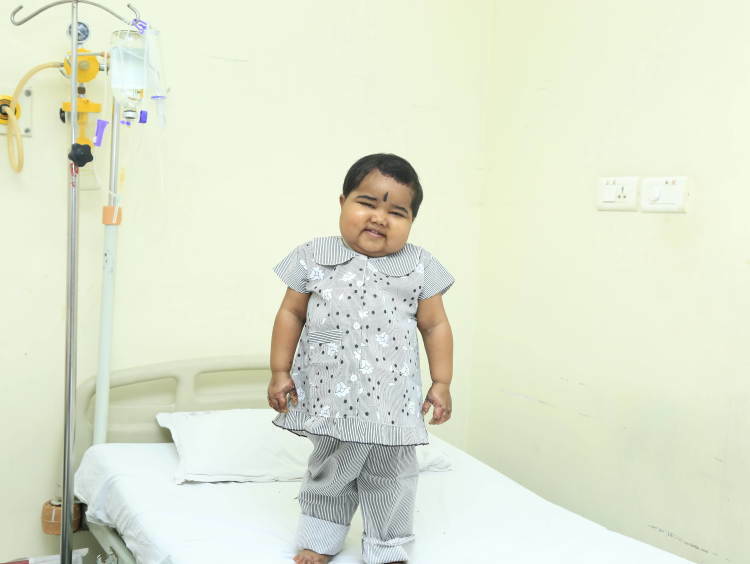 Finally, after three years of waiting, a blood test was able to detect that Ancelet had a genetic disease that is killing her slowly,” says Seeba. Blood transfusions were a regular affair for Ancelet, but since January her platelet count has come crashing down and she is very critical. Her body has become swollen, especially her spleen. The skin folds of her neck and legs have thickened – even moving a little has become painful. The lesions on her skin add to her struggle. 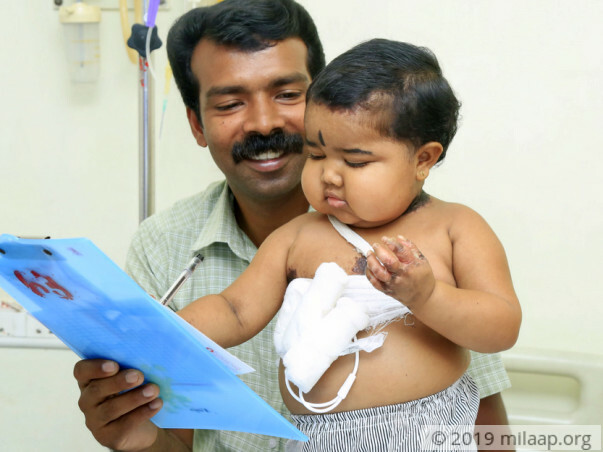 “In January, she was admitted in a hospital in Kottayam (about 100 km from our village) when the doctors said that she needs advanced treatment. We left our hometown, Idukki, and brought her to a hospital in Madurai as her condition is getting worse. I had to borrow money from kind neighbours and relatives as I didn’t have enough money to take her to Tamil Nadu for treatment,” says Joby, who is a driver. Since Ancelet had a low platelet count, she was never allowed to run or walk fast. Her parents were scared that she would be injured and her wounds wouldn’t heal. Her mother or father would carry her most of the time, despite her being eager to walk all the time. She was never allowed to mingle with kids in her neighbourhood for the risk of contracting infections. “I know that it is a cruel thing to not let your children have friends. But for us, our baby’s life is more important than anything. Imagine worrying about whether the worst will happen to your kid, every day. That is what I went through these three years. I never let her out of my sight, even for a second. We tried to be her friends – hiding our sorrow and playing and laughing with her as much as we could. But now, the doctors tell me I should be prepared for anything,” laments Seeba. Ancelet has severe zinc deficiency and the doctors have advised that she have large doses of a medicine – almost like food – to help bring up the zinc levels in her body. But Ancelet hates it. “It is very difficult to give Ancelet medicines. She will spit it out in an instant. I don’t know how to make my innocent child understand that without these life-saving medicines, she will not survive,” says Joby. A bone marrow transplant is the only way Ancelet’s life can be saved, and her father is ready to be the donor. It costs Rs 20 lakh – an amount that Joby cannot afford. “Earlier I used to go for private trips as a driver, but now I have been not going for work regularly as 75% of my time is spent in hospitals and clinics. And now since we have come to Madurai for treatment, the expenses have only doubled. We had to rent a room near the hospital as Ancelet has to be taken for regular check-ups. The tubes in her chest are making her restless and the heat is something she is not used to. I pray we get enough money to put her out of her misery, so that we all can get a new life,” he says. 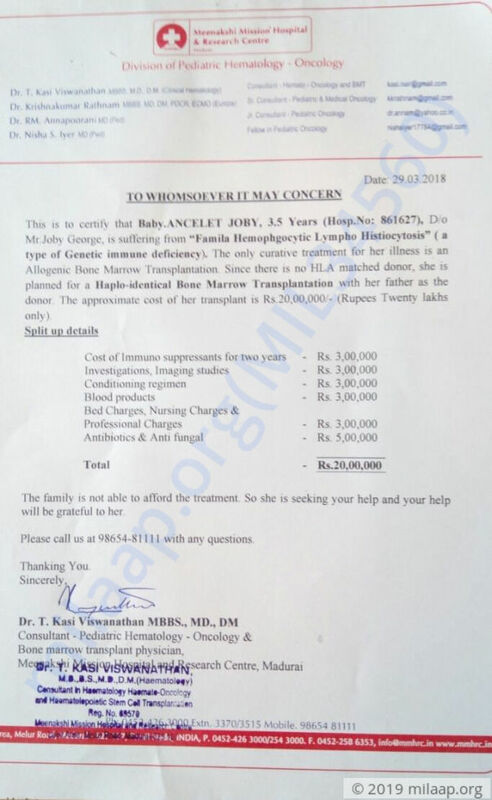 Your small contribution can save Ancelet's life. 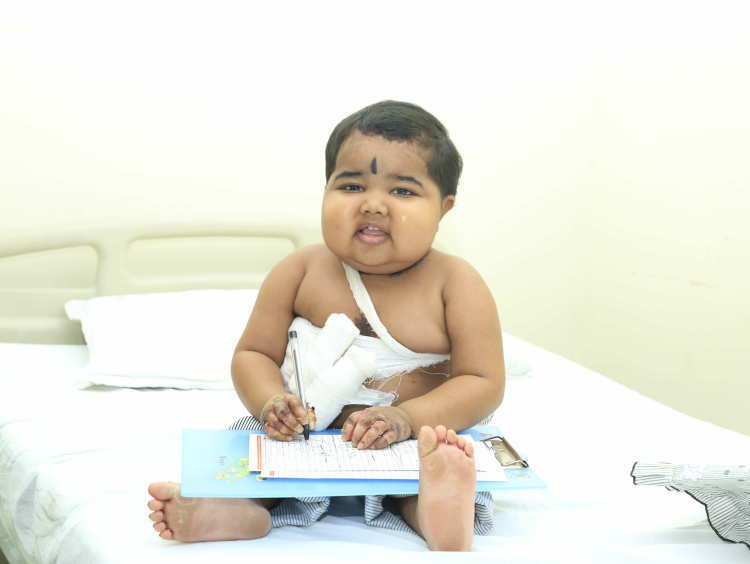 Baby Ancelet was undergoing transplant but during the course of treatment she developed a serious infection. Doctors tried their best but could not save her. We are really thankful to the people who came forward to support this little one. All the funds raised through this campaign will be utilised towards her treatment. We pray to God to give strength to the parents to bear this irreplaceable loss. 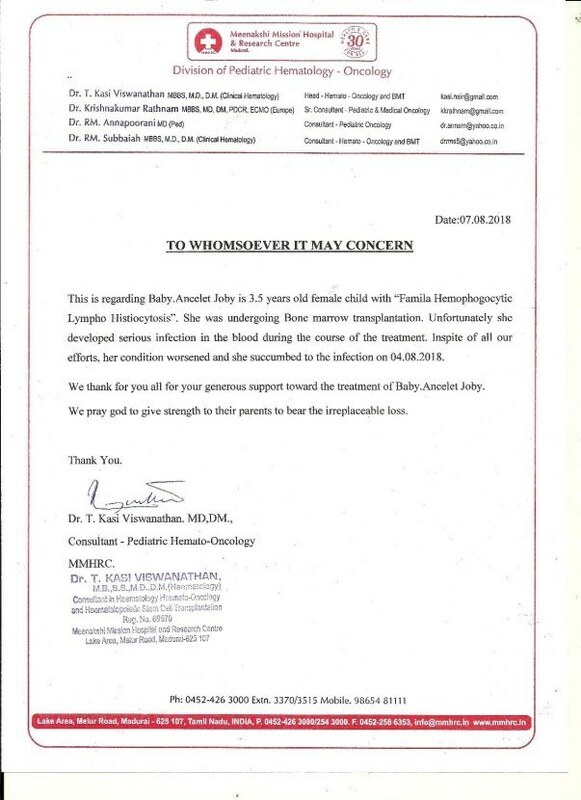 Baby Ancelet had candida sepsis.she was sick requiring ICU stay for one week duration.she required multiple iv antibiotic and anti fungal cover,multiple blood product transfusions. 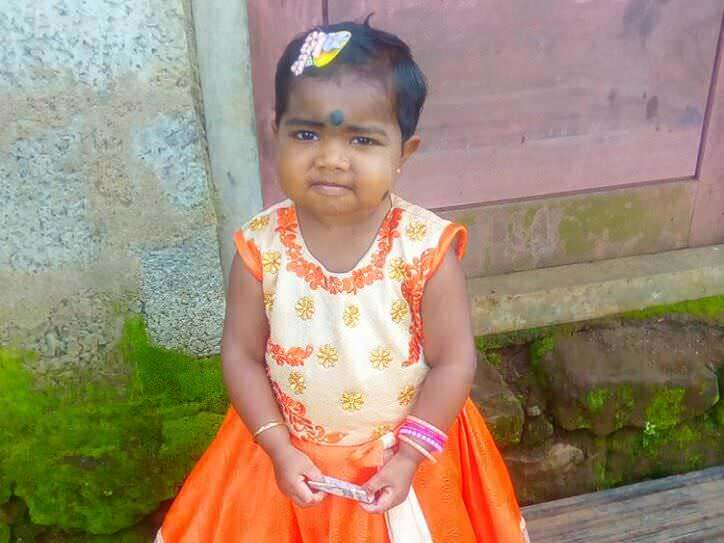 she has recovered from the illness now and we are planning for transplant in another 2 weeks duration.Due to the unforeseen complications,we have used the milaap funds for the previous hospital admission. We request to please share her campaign with your network so that it will be helpful for the bone marrow transplantation expenses. we thank you and the donor for the timely funds that was helpful to support and save her. Ancelet is under medication and antibiotics for the infection. She was rushed to ICU because of severe fever and wheezing. There is some gradual improvement in her health. 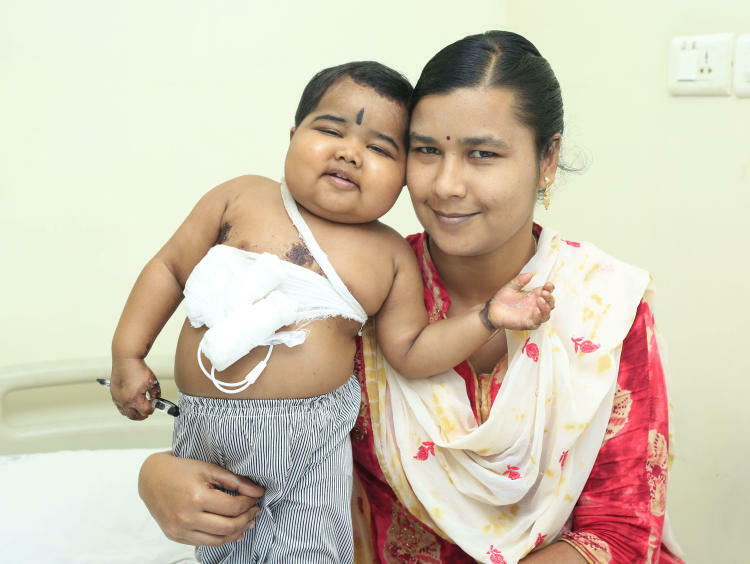 The transplant is still in the line for her and the donor will be travelling from Dadri. The pre-transplant procedures may begin by the end of this month. Thank you so much for the love and support which you have shown towards her, we shall keep you all posted.